Providing a top quality chrome plating and restoration service to both enthusiasts and trade. 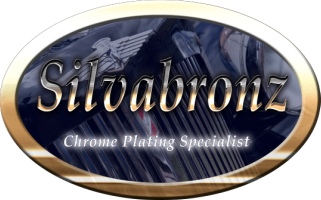 Silvabronz having been established 1987, have built a wealth of experience in the restoration of all metallic components for the classic car and bike industry to both the trade and the enthusiast. At Silvabronz they are fully sympathetic to the requirement to retain the authenticity of the finished classic car and therefore offer the full range of metal finishes achieving this end result, from nickel, silver through to chrome. The process of Triple Plating ensures that the client’s finished component, exhibits the deep, rich, lustrous finish that befits the classic vehicle. So whether the requirement is for the re-silvering of you your traditional headlight through to re-chroming of the largest of bumper, then Silvabronz have the service to fulfil your requirements, supported with the confidence of years of knowledge and a quality system with ISO 9001:2008 approval.